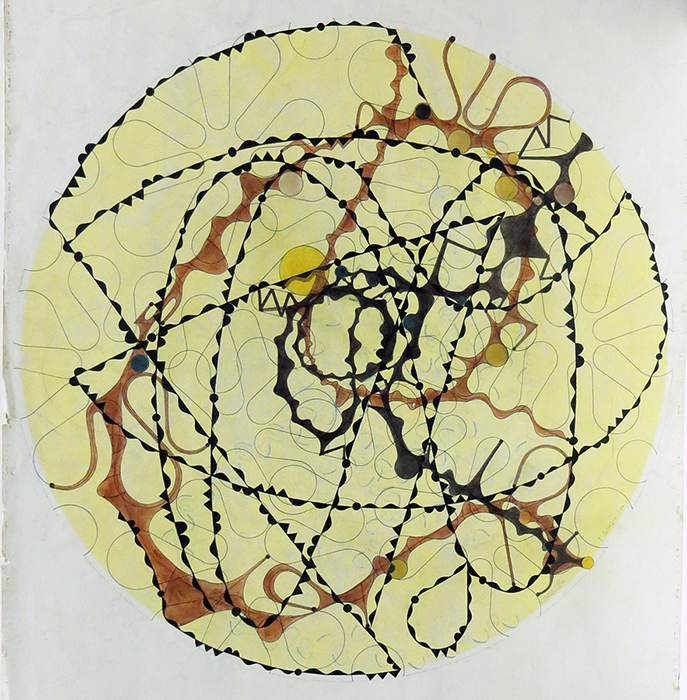 The Artists Archives of the Western Reserve (AAWR) is pleased to announce its Summer exhibition NewCelle +1, featuring the collaborative drawings of Archived Artist Bea Mitchell, John Jackson, Ed Mieczkowski and Achala Wali. From early in his career, Mieczkowski “extolled the virtues of artist groups as a viable way to generate ideas.” NewCelle was directly preceded by two Mieczkowski-lead collectives, Anonima, which played a prominent role in the emergence of Op Art in the mid 1960’s, and Drawing in the Community, which emerged from a class taught by Mieczkowski at the Cleveland Institute of Art. Bea Mitchell, John Jackson and Achala Wali all began as Drawing participants, though ultimately both Jackson and Mieczkowski took issue with the group’s loose organization and its eclectic membership, many of whom, according to John, “were not visual artists.” Mieczkowski, Mitchell and Jackson broke away from Drawing in 1998 to create NewCelle, a group that while intellectually descended from its predecessors, was distinct in its philosophy and experimental methodology. Though Achala was not an original member of the group, she did eventually join the collective. NewCelle’s influence on her work and her stead-fast support cannot be understated. NewCelle’s unique process was “informed by the science of chaos and complexity, emerging information about consciousness and [their] own spin on the surrealist practice termed psychic automatism.” Members would take turns working on a single surface, drawing continuous lines then passing the piece to their fellow-artist for the 2nd line to be laid and so forth. Each time the group met, a new piece was introduced until a full 9 works were in rotation. Above all, NewCelle was governed by a paramount aesthetic principle- the entirety of the drawing had to remain within a circle, a barrier which is visible in the finished work as a thin graphite or ink ring keeping individual parts bound by the collective. NewCelle met its end in 2001 when Mieczkowski left for the West coast to pursue his solo endeavors. The group dissolved under the weight of dispersant interests and what Jackson politely described as the pressures of a “provocative mix of dispositions.” A short time later, John Jackson’s own career met its tragic end when he was killed a 2006 double murder- a catastrophe that also took the life of photographer Masumi Hayashi and shook the Cleveland artistic community to its core. The exhibition, NewCelle +1 opened on May 18th, 2017 and will feature both the communal works of NewCelle, as well as singular works by each artist, including framed and unframed works on paper and sculpture by John Jackson. An Artists’ Reception will be held on Thursday, May 25th from 5:30-8:00pm. In celebration of this occasion, complimentary Mitchell’s Homemade Ice Cream is being served as the proprietors are relatives of Archived Artist Bea Mitchell.